The Plant Cafe sits facing Cathedral Green opposite the war memorial, so you can sit outside and enjoy watching activities on the green. The current version of this cafe is owned and run by the staff after they took it over form the previous management. I think the take over benefitted the customers! Well, all the food is vegetarian and very good too! It may not be the cheapest cafe in Exeter but it has good fresh food that is well presented. Sitting outside is always pleasant although inside is cosy on a colder day. It won’t surprise anyone who knows me to hear I think their best product is their cake! 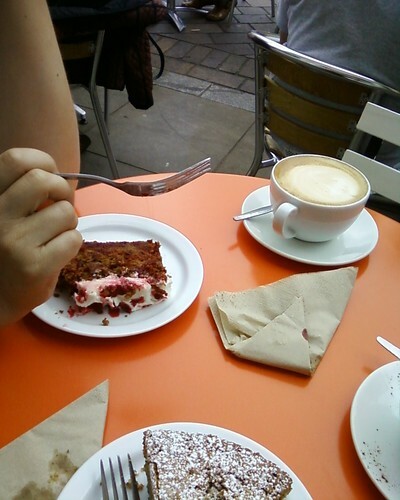 Particular favourites are their almond based cakes and their beetroot and raspberry cake. I can also recommend their cappuccino as a good smooth coffee served in a cup and saucer. This cafe gets very busy so plan to get there early and be prepared to wait for a table. I only had bad service once from an impressively rude waitress but I had a courteous apology and a refund for the food that hadn’t been delivered so I’m still happy to recommend this cafe.